Courtesy of G. Dolling et al., Opt. Lett. 31, 1800 (2006). The design and manufacturing of nanostrucrtured materials has been made possible thanks to progress made in both materials science and electrical engineering. Most part of nanostructured materials for electromagnetic applications refers to so-called metamaterials which present exceptional properties, dominated by their geometrical structure. Perhaps in the most generic way, metamaterial can be defined as an arrangement of artificial structural elements, designed to achieve advantageous and unusual electromagnetic properties. The concept of material implies homogeneity, i.e. the distance between elements should be small enough. If a metamaterial is a periodical structure, the lattice constants should be considerably smaller than the wavelength in the medium. This distinguishes metamaterials from so-called photonic (electromagnetic) crystals which are discussed below and from so-called frequency-selective surfaces, whose useful and unusual electromagnetic properties originate mainly from the periodicity of their structure. In contrast to photonic crystals, metamaterials possess such properties due to specific electromagnetic response of their ”artificial molecules” and not due to specific distances between them. The electromagnetic properties of ”molecules” are determined not only by their chemical composition, their geometrical shape plays an important role. The chemical composition is usually chosen so that the response of the inclusion is high (conductive materials, high permittivity materials, ferromagnetic materials) and losses should be minimized. Specific engineered properties are designed primarily by choosing the inclusions shape and mutual arrangement. 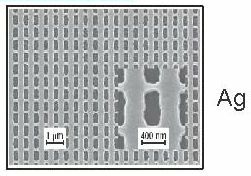 The tools needed to create metamaterials include modelling, geometry and property design, bottom-up manufacturing and structural and electron microscopy characterization at the nanoscale. Electromagnetic characterization represents a basic challenging problem of the modern electromagnetic science. Electromagnetic properties of nanostructured metamaterials are determined by the shape of the constituent nanoinclusions, by their concentration, by their geometric arrangement and by their material parameters. Due to this increased complexity the electromagnetic characterization of metamaterials has become a science in itself. Effective material parameters are often extracted from numerically simulated or experimentally measured reflection and transmission coefficients. Traditionally, these effective parameters are the phenomenological material parameters: permittivity and permeability. In the case for natural materials (and also for composite bulk media which cannot be referred to metamaterials but behave as effectively continuous structures) these parameters give a good description of the electromagnetic behavior. But metamaterials can not always be characterized this way. Many metamaterials need more parameters for their characterization and in general, the validity of material parameters is to be questioned. Why effective material parameters are needed? Introduction of effective parameters of a material is called homogenization, because in this approach a heterogeneous structure is replaced by an effectively homogeneous one. Any homogenization theory is an approximation, because it employs a restricted number of parameters to describe structures samples with huge numbers of inclusions. In the case of metamaterials the response of these inclusions is dispersive (significantly depends on time when the applied electromagnetic field is a pulse and on frequency when this field is time-harmonic). Long computation time strongly restricts the opportunity of the researcher to analyze the electromagnetic phenomena that occur in the material and moreover to understand its electromagnetic properties. To design of a new electromagnetic material the researcher should find the optimal shape and chemical content of inclusions, their optimal size and mutual arrangement, the optimal distance between them, etc. This means that many realizations of the material should be considered before the optimal design is obtained. If this process is based on the exact numerical simulations the optimal design becomes a hopeless task. The homogenization allows one to avoid the exact simulation of each realization of the material. The homogenization means that material parameters of an artificial material are obtained and constitutive relations in which these parameters enter are known. Then one can analytically solve macroscopic Maxwells equations equipped with these constitutive relations.